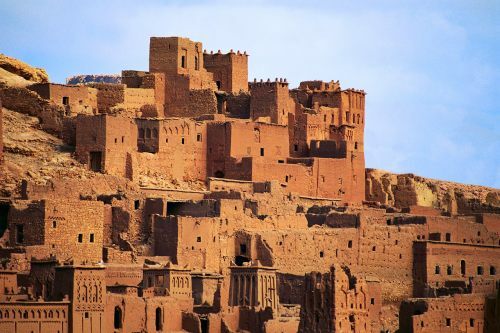 British Airways is showing flights from Vancouver to Marrakech, Morocco for $678 CAD roundtrip including taxes. This is an incredible 50% below the typical best prices between Vancouver and Morocco. However, these flights do require an overnight stay in London in each direction, which should be factored into the cost. IMPORTANT: An overnight stay in London is required, each way. It also requires transferring between Gatwick and Heathrow. 3. Click through from Momondo.ca to Nanak Flights for booking. You can try experimenting with extending your stay in London, to see how it affects the price. The cheapest I've been able to find is between $744 and $815 CAD, depending on whether you extend the stay on the way there, or in both directions. Here are some searches on Momondo you can start with. If you want to try experimenting with other dates, or longer stays in London, you may want to start by using departure and return dates from the list above. Play around with the dates for the flights in between. If you find anything cheaper for extended stays, help out your fellow traveler and comment below. 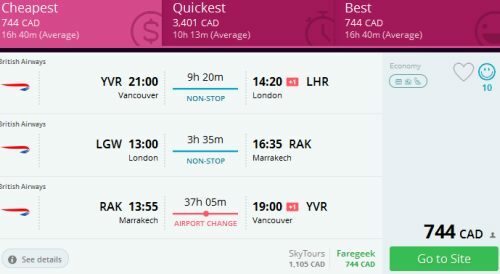 Update 5/19 @ 7:30 AM PST - KLM is now showing flights from Vancouver to Marrakech, Morocco for $684 CAD roundtrip including taxes. They are also available from Victoria for $44 more. The flights have an overnight layover in Amsterdam on the way home. 2. Click 'Change' to try other dates. Try starting with Wed to Wed dates in October, November, or December 2016. Or January, February, or March dates in 2017. Keep the dates flexible. You should see a variety of date combinations. 3. Click through from Kayak to the KLM or Delta website. but when it comes to making the booking, you may find that the KLM website doesn't seem to work well from Victoria. Take the same dates you found on Kayak, and try searching on Momondo.ca and booking through one of their associated booking partners. vancouver, yvr, flight deals, africa, morocco, northern africa, british airways, marrakesh, rak and marrakech.